A Castlemead turkey is the pièce de resistance for any Christmas table. 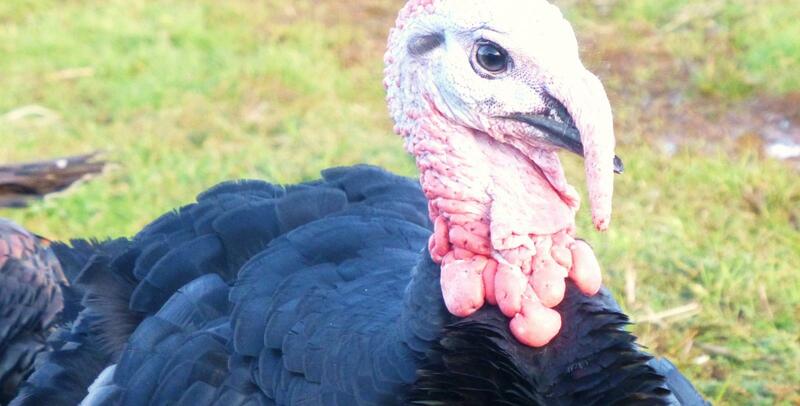 Leisurely raised and using traditional farming methods the turkeys are free to roam the surrounding Somerset fields, striding in and out of their freshly bedded shelters where they sleep at night protected from Mr. Fox. We use only locally milled cereals to match the birds’ dietary needs, with no added extras such as additives or hormones - the rest is left to nature. The turkeys are moved at night and processed onsite by our dedicated team to reduce the birds’ stress and cut production time. They are then hung for 10-14 days resulting in fresh, delicious meat for your Christmas lunch. Why should I choose Castlemead over supermarket turkey? The most popular turkey size we sell is the smaller 5-6kg, oven ready. ; a size similar to what you will see in many supermarkets. What sets our turkey apart from the well known retailers is that we use specific strains of turkey that mature at different weights. All of our birds are hatched on the same day, fed the same diet and are processed at the same time, but the freedom they are given during their life means that they are able to grow at their own speed and mature. It is clear that like humans, turkeys grow to all shapes and sizes. So what if we took the largest growing turkey, which is the cheapest to produce, and slaughtered it as soon as it reached 5-6kg? This is how your standard supermarket turkeys are produced, meaning that they have not been given the time to mature; some can be as young as 14 weeks old. An immature bird not only lacks texture and flavour, it also lacks the hard fat that is used for basting whilst cooking. Our small turkeys are always hen birds grown to 24 weeks of age. Although significantly more costly this process gives them more time to mature, develop and become delicious for your Christmas table. We dry pluck our birds and leave them to mature for 10-14 days before preparing them for your roasting dish. This process is called 'game hanging', allowing the fat to marble and the meat to tenderise resulting in extremely tender and moist meat for melt-in-your-mouth deliciousness. This type of process is costly and can only be done by dry plucking and rearing the birds to maturity, ensuring that they have a hard layer of fat under the skin for depth of flavour. Supermarket birds are usually wet plucked using large machines for low costs and bulk processing. Often the birds are prepared hot without being game hung; this produces dry and tough meat. Some supermarkets even sell birds slaughtered in November and use a process called 'gas flushing' to artificially seal the bird in a bag to stop it from going off. Step 1. Roll out your pastry onto a floured surface and cut out 8x10cm circles for the bases, and 8x9cm circles for the lids. Step 2. Place the bases into a muffin tin and fill intermittently with turkey, cream and cranberry sauce. Season to taste. Step 3. Brush the edges with egg and place the lids on top, pinching the sides to seal them. Chill for 15-20 minutes. Step 4. Brush the tops with egg and bake for 25 minutes, or until the pastry is crisp and golden. Serve warm or enjoy cold. Here are our top tips to cooking the perfect Castlemead turkey. Prepping your bird: Remove the giblets from inside the bird and store them in the fridge. Cover your turkey in soft butter and season. TOP TIP Allow your turkey to reach room temperature before cooking. TOP TIP Lay bacon over the turkey breast for extra taste. Cooking time: If the turkey is over 4kg, calculate 20 minutes per kg plus 90 minutes. (If the turkey is under 4kg, plus 70 minutes). TOP TIP Weigh your turkey after it has been stuffed for an accurate cooking time. TOP TIP Turkeys are easy to over cook so regularly check yours to ensure it stays moist and succulent. TOP TIP Half an hour before it is cooked, remove the foil to bronze the breast. TOP TIP When cooked, remove the turkey from the tray and turn it upside down to allow the juices to distribute through the meat. Leave to stand for at least half an hour.